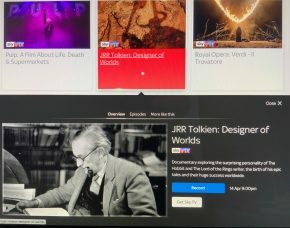 Sky Arts is to broadcast a TV documentary on Tolkien on Sunday 14th April at 9pm [BST]. Information from the Sky website: Documentary exploring the surprising personality of The Hobbit and The Lord of the Rings writer, the birth of his epic tales and their huge success worldwide. Those who wend their way to Middle-earth often find an inviting home there, be they the hippies who embraced Tolkien’s books, the film fans who loved the epic scale of the movies or those – like me – who first discovered The Lord of the Rings through the atmospheric Radio 4 adaptation starring Michael Hordern and Ian Holm.